'Bergekran' - Usage in Locks and Wharves - 1498297137s Webseite! Designing and manufacturing of the lifting lift in combination with the use of the best materials, guarantees a long service life, perfect function and safety in case of a rescue. 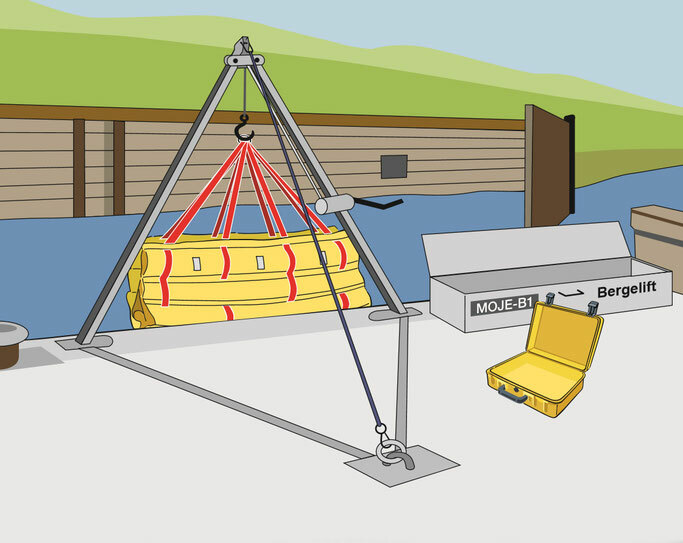 The 'Bergekran' with passenger winch is a reliable recovery system at your shipping lock or aboard your ships on the waterways. The 'Bergekran' as a companion for your dangerous work on the water. Immediate recovery of people after a crash. We offer the reliable recovery protection of your employees in the future including assembly service and annual inspection. We are there for you - Our service is set up for the mandatory inspection of PSA (PersonenSchutzAusrüstung, 'Personal Protective Equipment') at least once a year. Winches are checked by our company in accordance with the statutory provisions, if necessary repaired and provided with a test certificate, as proof of the safety check carried out. Our offer for the rescue systems at your hydraulic structure is an annual risk assessment are in accordance with the DGUV Regeln 114-014 - 'Wasserbauliche und wasserwirtschaftliche Arbeiten' (bisher: BGR/GUV-R 2102). The use of PPE (Lifejackets) is mandatory at hydraulic structures and on federal vessels to avoid the dangers of falling into the water. Salvaging employees remains a major challenge. A few minutes in cold water can lead to hypothermia and heart failure leading to life-threatening situations in the water. The immediate loss of strength no longer allows the casualty to climb independently on ladders or pilot ladders. More importantly, due to the water temperature - time - becomes the vital factor in the surivial of the casualty. The International Convention for the Safety of Life at Sea (SOLAS) prescribes plans, requirements and procedures for the recovery of casualtied persons from the water for all SOLAS vessels (see Chapter III, Rule 17-1, Guidelines on the Development of Plans and Procedures for Recovery of persons from the water]. Horizontal recovery is recommended here as a priority recovery procedure! Even if there is no equipment requirement on your ships, MOJE Rescue Systems recommends implementing procedures and regulations for the recovery of casualties from the water. The need for a suitable recovery system will allow you to gain valuable time in an emergency and begin the rescue operations until federal rescue workers arrive. A complete care of the rescued individual(s) will be provided by the federal rescue workers. The establishment of a Water Rescue Lift rescue system will become an integral part of the risk assessments for the protection of the workers and ensure meeting the ArbSchG (Arbeitsschutzgesetz, 'Labor Protection Law'). The water rescue lift MOJE M1 and the mountain lift is a certified rescue device according to DGUV. • maintenance with testing of our rescue systems. Risk assessment for the use of the salvaging lift on hydraulic structures. Creation of operating instructions x1 piece, incl. Instruction once a year for 1-15 persons on the object. Maintenance per Water Rescue Lift unit. We will gladly make you a non-binding offer for the installation of our rescue systems.